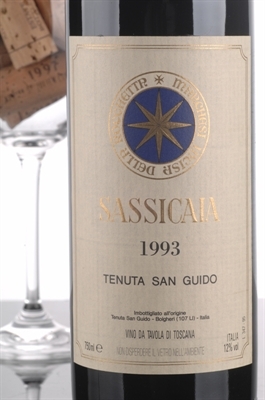 A tannic, stern, austerely-styled Sassicaia, the 1993 reveals a dark ruby/purple color, followed by attractive cassis fruit with weedy tobacco and herbs in the background. A tannic, stern, austerely-styled Sassicaia, the 1993 reveals a dark ruby/purple color, followed by attractive cassis fruit with weedy tobacco and herbs in the background. New oak is present, but not intrusive. The wine is medium-bodied, with high tannin, good acidity, and a firm, structured feel on the palate. Give it 2-3 more years of cellaring, and drink it over the following 10-15+ years. The 1993 will never be remembered as one of the great Sassicaias.